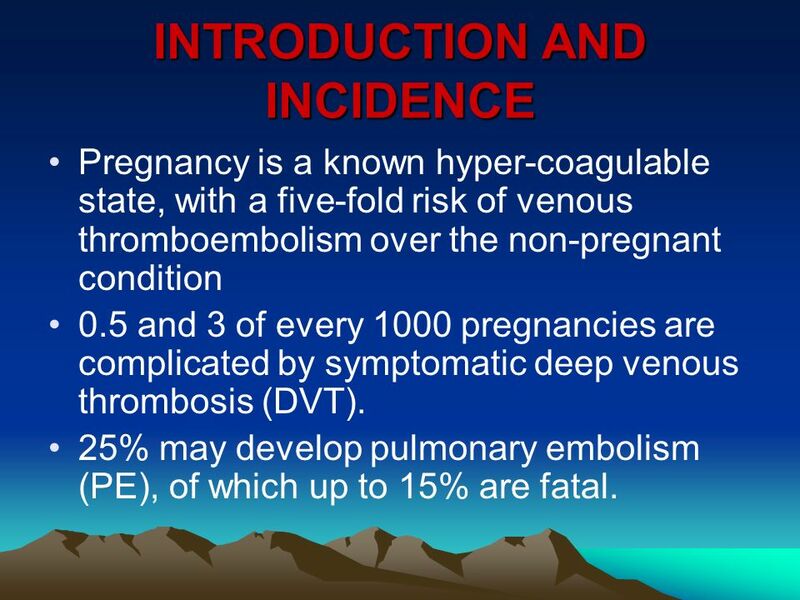 Pregnancy is a known hyper-coagulable state, with a five-fold risk of venous thromboembolism over the non-pregnant condition 0.5 and 3 of every 1000 pregnancies are complicated by symptomatic deep venous thrombosis (DVT). 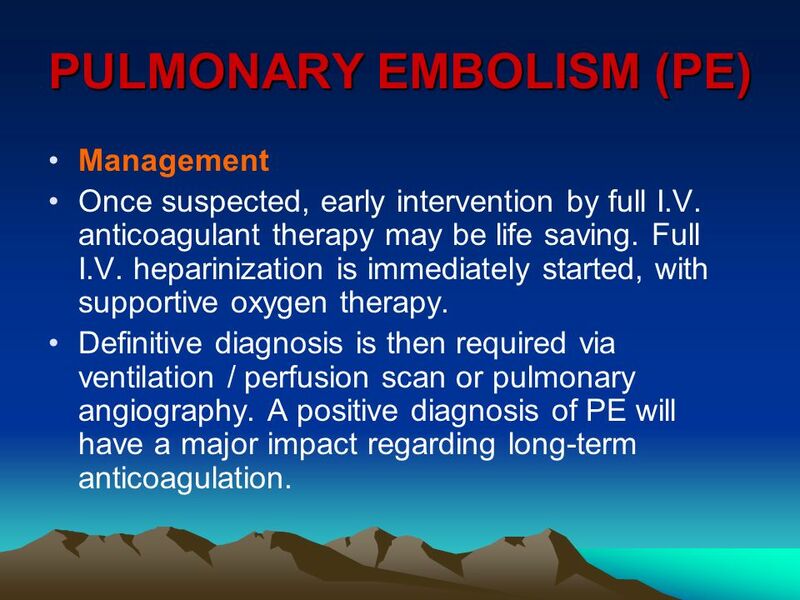 25% may develop pulmonary embolism (PE), of which up to 15% are fatal. 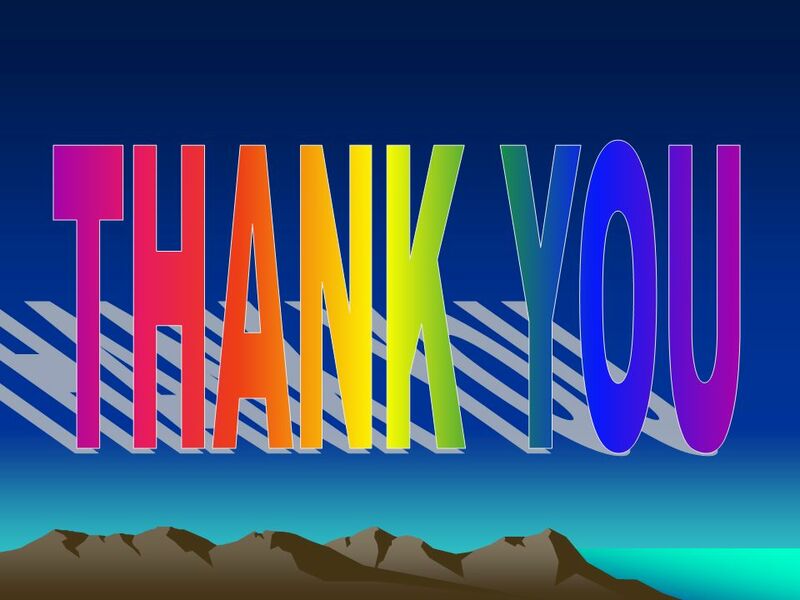 This is mostly associated with the antiphospholipid syndrome (APS). APS is the combination of lupus anticoagulant (LAC) with or without, anticardiolipin antibodies (ACA), with a history of recurrent miscarriage and or thrombosis. Inherited thrombophilias Protein-C, protein-S, and Antithrombin III deficiency. Maternal age > 35 years. Pre-pregnancy weight > 80 kg. Pre-existing Thrombophilia. Previous DVT. Severe varicose veins (V.Vs). Prolonged bed rest. Multi foetal pregnancies. Severe pre-eclampsia. Caesarean section delivery. Sepsis, especially pelvic. 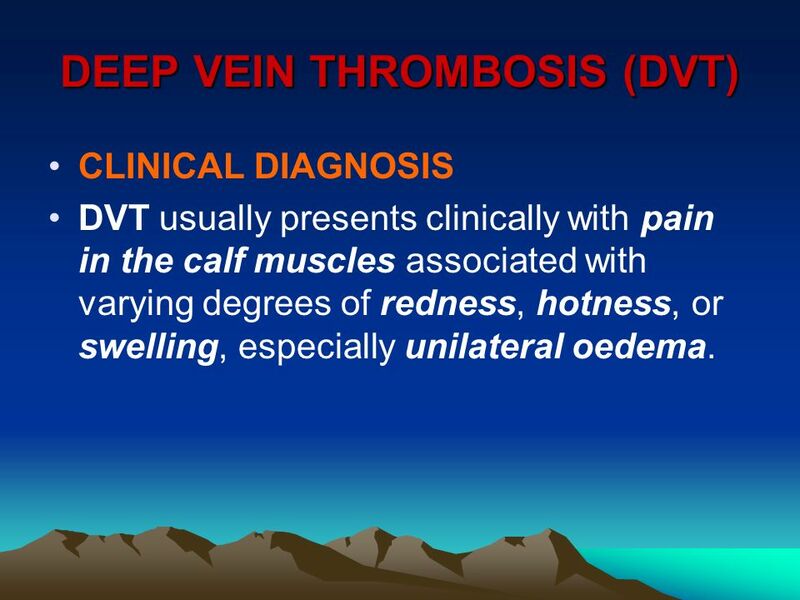 CLINICAL DIAGNOSIS DVT usually presents clinically with pain in the calf muscles associated with varying degrees of redness, hotness, or swelling, especially unilateral oedema. INVESTIGATIONS Colour Doppler Ultrasound: It allows assessment of the deep veins between the knee and the iliac veins and also allows for the dynamic assessment of femoral and iliac veins. 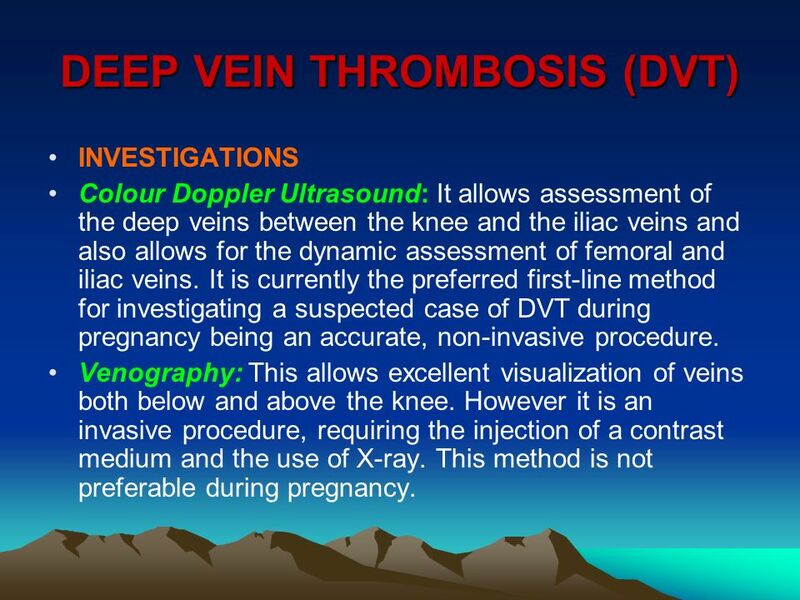 It is currently the preferred first-line method for investigating a suspected case of DVT during pregnancy being an accurate, non-invasive procedure. Venography: This allows excellent visualization of veins both below and above the knee. However it is an invasive procedure, requiring the injection of a contrast medium and the use of X-ray. This method is not preferable during pregnancy. MANAGEMENT Anticoagulant therapy 1. Heparin and LMW heparin derivatives: The preferred initial line of treatment, as they do not cross the placenta, are not teratogenic, and their effect can be stopped within hours by withholding further doses. 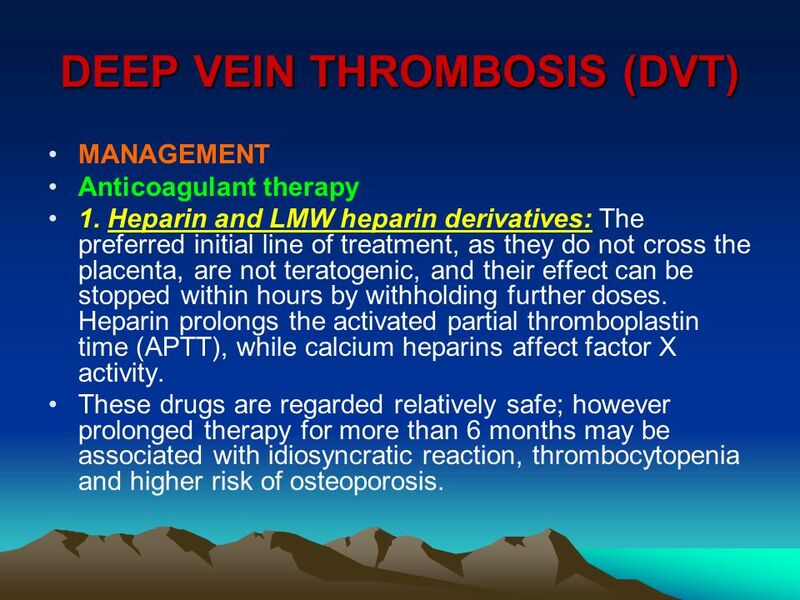 Heparin prolongs the activated partial thromboplastin time (APTT), while calcium heparins affect factor X activity. These drugs are regarded relatively safe; however prolonged therapy for more than 6 months may be associated with idiosyncratic reaction, thrombocytopenia and higher risk of osteoporosis. 2. 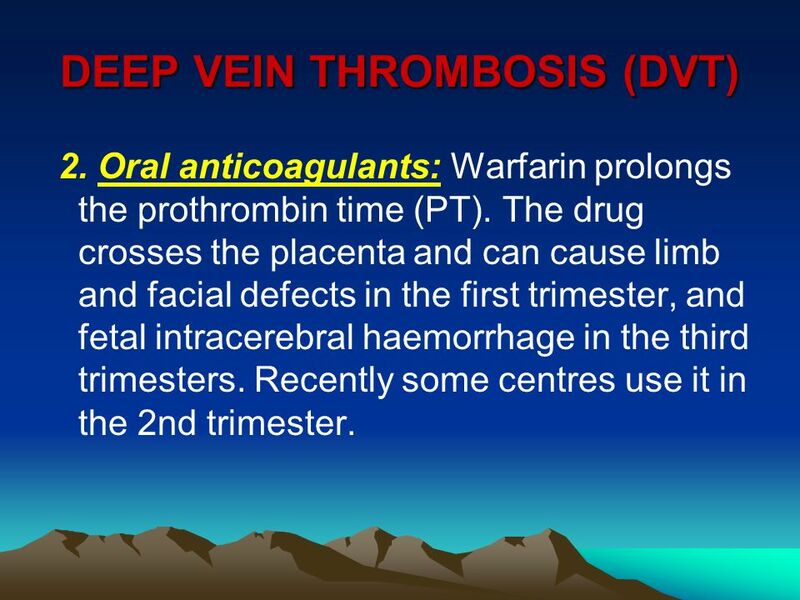 Oral anticoagulants: Warfarin prolongs the prothrombin time (PT). The drug crosses the placenta and can cause limb and facial defects in the first trimester, and fetal intracerebral haemorrhage in the third trimesters. Recently some centres use it in the 2nd trimester. 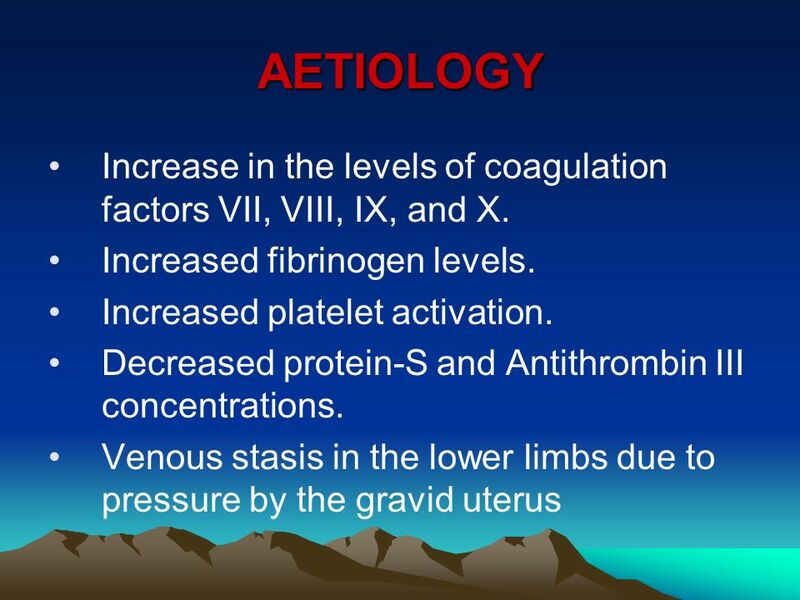 Anticoagulant prophylaxis Women with a history of DVT occurring during or following a previous pregnancy are given prophylactic LMW heparin derivatives during subsequent pregnancies at least in the last trimester that extends at least to the end of the puerperium. 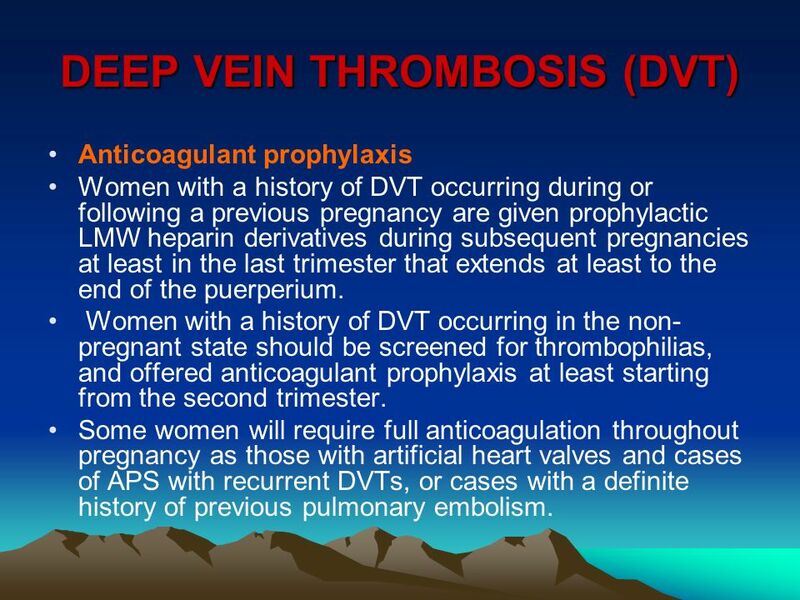 Women with a history of DVT occurring in the non-pregnant state should be screened for thrombophilias, and offered anticoagulant prophylaxis at least starting from the second trimester. Some women will require full anticoagulation throughout pregnancy as those with artificial heart valves and cases of APS with recurrent DVTs, or cases with a definite history of previous pulmonary embolism. 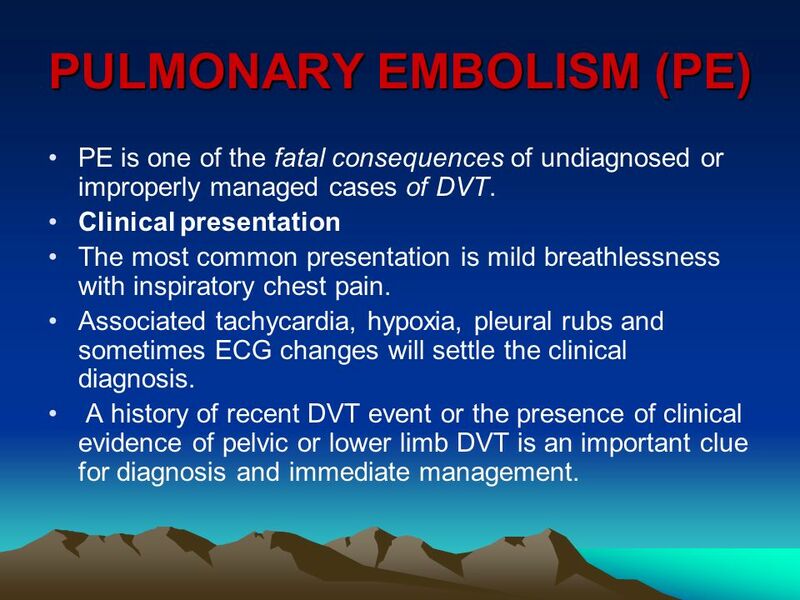 PE is one of the fatal consequences of undiagnosed or improperly managed cases of DVT. Clinical presentation The most common presentation is mild breathlessness with inspiratory chest pain. Associated tachycardia, hypoxia, pleural rubs and sometimes ECG changes will settle the clinical diagnosis. A history of recent DVT event or the presence of clinical evidence of pelvic or lower limb DVT is an important clue for diagnosis and immediate management. Management Once suspected, early intervention by full I.V. anticoagulant therapy may be life saving. Full I.V. heparinization is immediately started, with supportive oxygen therapy. Definitive diagnosis is then required via ventilation / perfusion scan or pulmonary angiography. A positive diagnosis of PE will have a major impact regarding long-term anticoagulation. 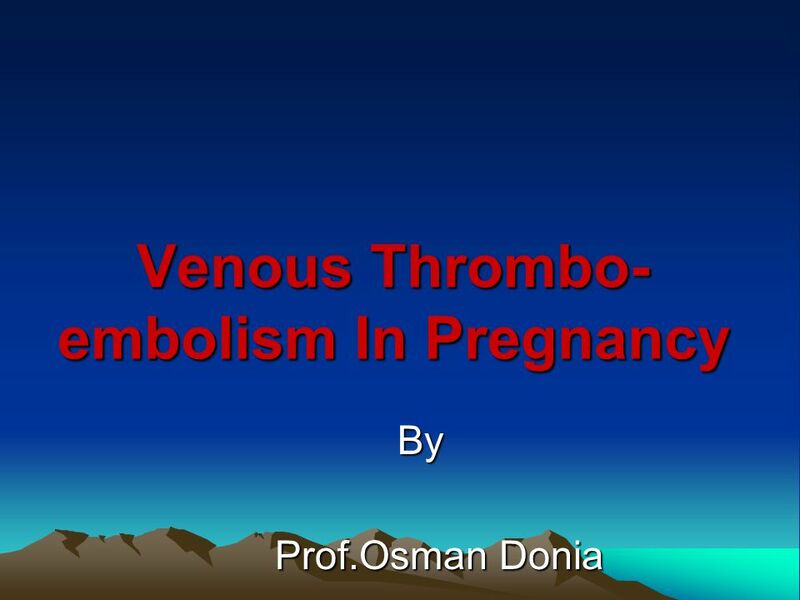 Download ppt "Venous Thrombo-embolism In Pregnancy"
Deep venous thrombosis and pulmonary embolism in pregnancy Petr Krepelka, 2013. 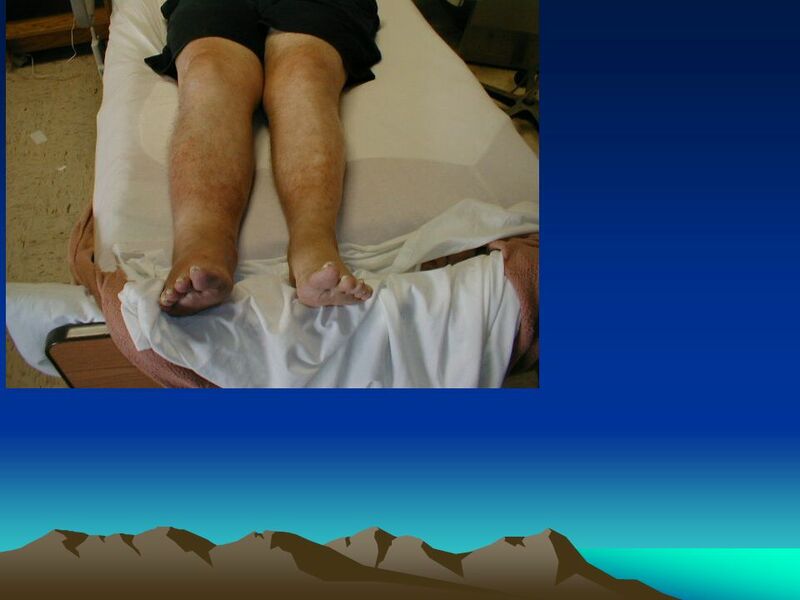 + Deep Vein Thrombosis Common, Preventable, and potentially Fatal. STROKE & PREGNANCY By Judith Barnaby, Stroke CNS Reviewed by Dr. Bayer, Stroke Neurologist, St. Michael’s Hospital. Bleeding and Thrombosis in Children Alice J. Cohen, M.D. Newark Beth Israel Medical Center. Thrombophilia. Now considered a multicausal disease, with an interplay of acquired and genetic thrombotic risk factors Approximately half of venous thromboembolic. Deep vein thrombosis David Hughes. Pathophysiology normal deep pelvic/leg veins thrombus (red cells, fibrin) around valves propagation Virchow’s triad. 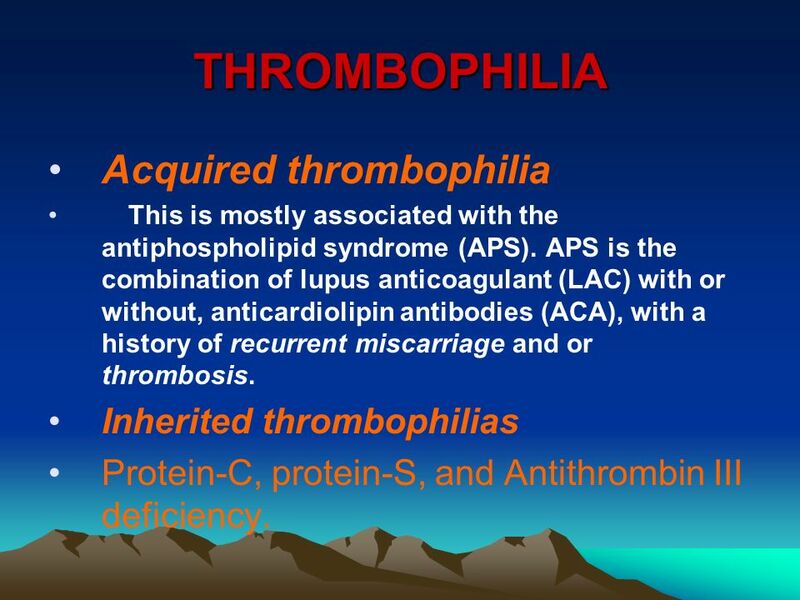 Increasingly, women who are asymptomatic present in pregnancy with a known thrombophilia, typically detected because of screening following identification. Regional Anesthetics and Anticoagulation Marie Sankaran Raval M.D. Boston Medical Center Department of Anesthesiology Nina Zachariah M.D. Pathology of Coagulation I- Deficiency of Coagulation Factors II- II- HYPERCOAGULABLE STATES. بسم الله الرحمن الرحيم Thromboembolic diseases in pregnancy. 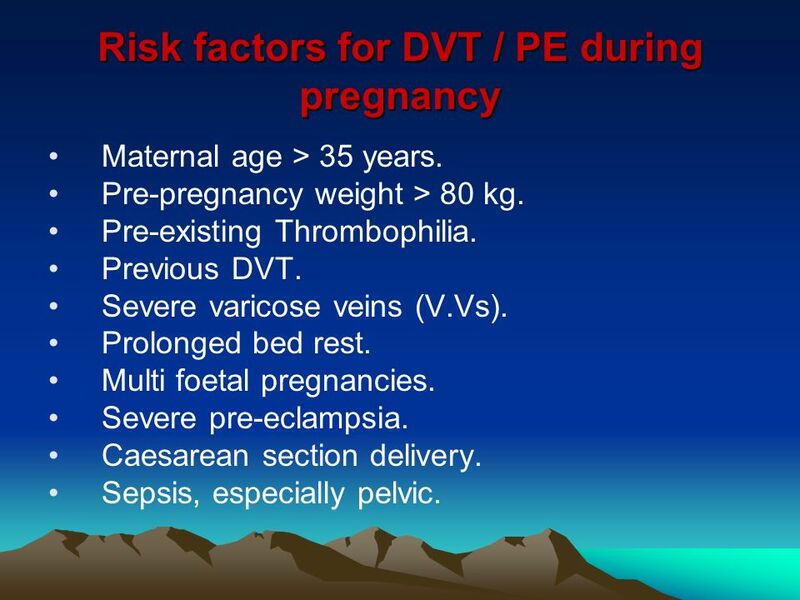 Below the Knee DVT and Pregnancy Related Thrombosis Robert Lampman, MD Morning Report July 2009. We know that during pregnancy, women have a five- fold  risk of VTE as compared to non-pregnant women. Absolute risk of group VTE during pregnancy is. Hypercoagulable States. Acquired versus inherited Acquired versus inherited “Provoked” vs idiopathic VTE “Provoked” vs idiopathic VTE Who should be tested.